Lord Ashcroft’s post-election poll (pdf here) showed the ‘three main reasons for voting’ for each political party in the 2015 UK general election. The biggest difference between parties was the number of people who voted on the basis that ‘the Party Leader would make the best Prime Minister.’ David Cameron, at 71%, far outstripped all his opponents, with Ed Miliband (the next most popular) coming in at 39%. On no other question did the Conservatives have such a large lead. Figure 2. Ashcroft Reasons for Voting Poll. This analysis is most clear-cut when there are only two main parties – as has been the case for most of the last 9 elections. Smaller parties complicate the picture. The Liberals or Lib Dems have had higher party leader ratings than the main parties before some of the last 9 elections. But in almost every case, that popularity did not translate into votes or seats. This may be because many people found Lib/ Lib Dem policies unobjectionable and were willing to express positive opinions about the leader of a party for which they had no intention of voting. Only in 2010, when Nick Clegg had an unprecedentedly high rating of 68% satisfaction, did the Lib Dems win enough seats to gain a place in the Coalition government with the Conservatives. So one needs some knowledge of the overall number of potential voters to interpret party leader ratings correctly. Figure 3 . Satisfaction with leaders of Labour, Conservative and Lib/Lib Dem Parties (Ipsos MORI data). To explain what I mean, we need to consider that the responses ‘satisfied’ and ‘dissatisfied’ are asymmetric. 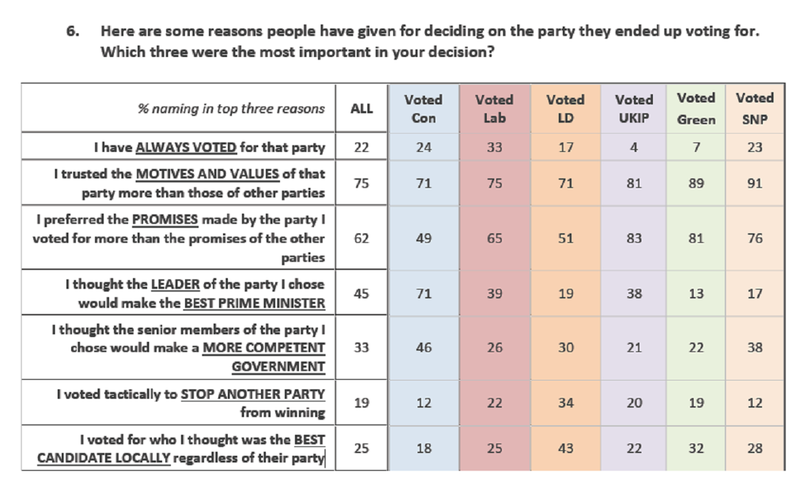 Party leader ratings reflect two categories of respondents – supporters of the party in question and those who have no allegiance to that party. Supporters are answering the question ‘how well is my party leader delivering policies with which I agree?’, while non-supporters are judging both the policies and the leader. I suspect that people who loathe a party’s policies are far less likely to say objectively that the leader is ‘doing a good job.’ So ‘dissatisfied’ respondents include a high proportion of people who do not support that party, while the ‘satisfied’ category is likely to contain a much higher proportion of party supporters. (Since 1994, Ipsos MORI have reported party leader perceptions among party supporters, which I plan to analyse in a later post (here)). The index also takes no account of uncertainty; thus a ’10 percentage point’ satisfaction index could represent 55% satisfied minus 45% dissatisfied respondents, or, say, 20% satisfied minus 10% dissatisfied (with a majority of ‘don’t knows’) which represent very different situations. The 2005 election was wrongly predicted by the index as Michael Howard had a relatively low dissatisfaction score combined with the highest ‘don’t know’ score across the whole dataset. 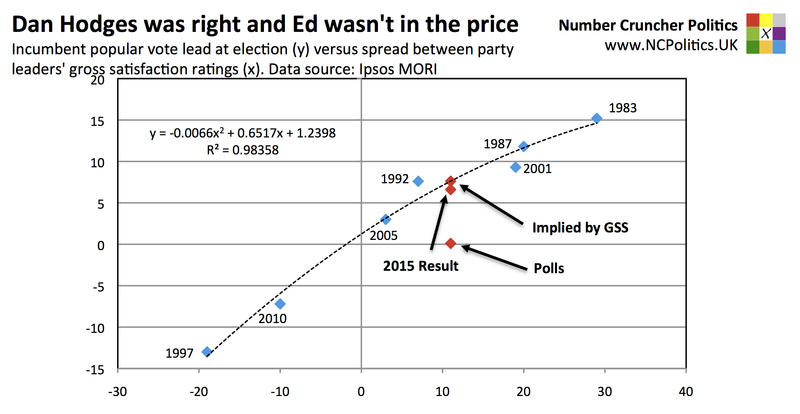 And regarding changes over time, not many people know whether a party leader’s rating is rising or falling. What matters is the party leader’s popularity (relative to that of their main opponent) at or shortly before the time of the election. People who are ‘satisfied’ with the party leader are more likely to be motivated to vote or to become active in the campaign. Figure 4. 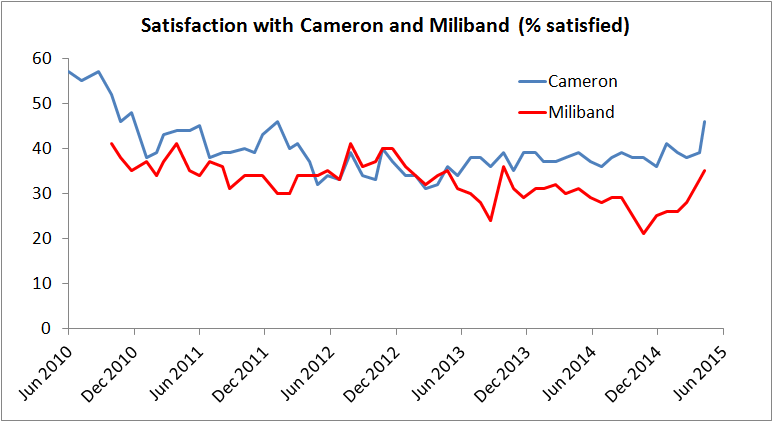 Satisfaction with Cameron and Miliband. Ipsos MORI. This entry was posted in government, Uncertainty and tagged David Cameron, Party Leader by Ruth Dixon. Bookmark the permalink. Very interesting analysis. The nature of the UK voting system makes it possible that a party which does not have the majority of votes has the majority of seats. Do you have data about the relation between these two? In other words, are there instances when a party won the majority of seats but not the proportion of overall votes? Thanks, Reiner. Jonathan has posted a link below that gives those numbers. It would be interesting to see how well the leader satisfaction numbers were reflected in actual vote share. I’ll try to find time to look at that. 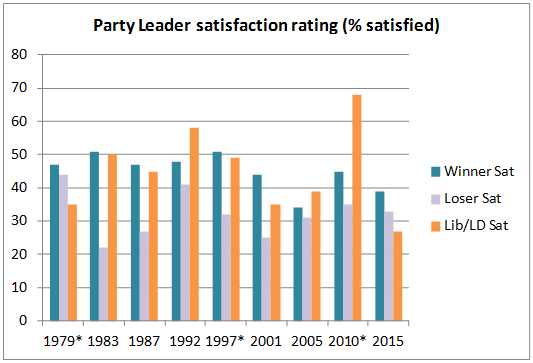 Matt Singh on Number Cruncher Politics has done exactly that calculation and shows an excellent relationship between the winner’s lead in ‘party leader satisfaction and vote share for the last 8 elections (not sure why 1979 is missing). It’s on the third page of his post on the 2015 election. Specifically, this graph. While there is not necessarily a simple link between votes and seats under first past the post, generally the party with the most votes wins the most seats, and this was true for the nine elections discussed above. The recent counter examples are 1951 and February 1974. David Runciman *: “So if you just ignore the question ‘who will you vote for’ and you ask people; which party leader do you prefer? David Cameron wins that by 10-plus points. And then the second question is; which party do you most trust on the economy? And the Conservatives win that by 10-plus points. So they are 10-plus points ahead on the two key questions. also from John Curtice, Professor of Politics at the University of Strathclyde in Glasgow. Thanks, those are very interesting quotes. I’m certainly not the only person to have pointed these things out (though I hadn’t seen the other examples until after writing this post!). See Matt Singh’s post here in which he predicts that the polls would be wrong (and his later post linked above). (Though I take slight issue with Kellner on the 1979 election – he says that was a case when party leader satisfaction did not predict the winner, but cites data from 6 months before the election. 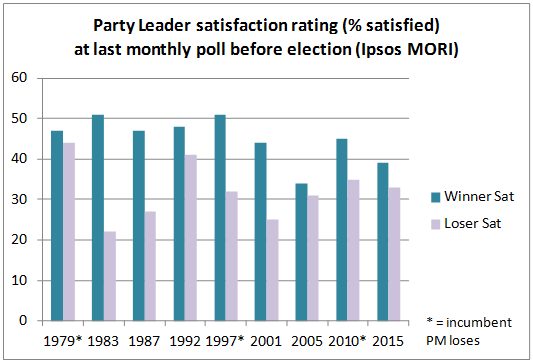 Ipsos Mori shows that Margaret Thatcher drew ahead of James Callaghan 4 months before that election). Yes Ruth although this fake certainty, and faith in experts thing is important for us in the Election and for the parallels into the Climate debate and science skepticsm , it’s bigger than that. My main concern is much more general that there is ONE REAL WORLD yet much of the time we humans have a fantasy world picture. I already know that NEWS is just infotaiment, that it doesn’t give us a true perspective, but this election thing exemplifies this. Even I was taken in by in, we spent time considering things which weren’t off this world. Just look at the transcript of that Australian “Rear Vision” programme. It’s absolutely awful. We might have been just reading a novel about an election ie FICTION versus the Non-Fiction book we think we were studying. Speculation is the enemy of truth ..in an election we can save wasting time , by just waiting for the result ie when we do know what the real world is. It begins “Kerri Philps here Thanks for downloading this week’s podcast of Rear Vision which explains why David Cameron’s Conservative Party WON’T win this week’s British general election despite presiding over the best economic recovery in Europe. I am not joking..she was that certain, and that wrong. – There is a real world, but it seems to me ABC’s internal culture is somehow how at odds with it. For things that we don’t know about they have a fantasy world view. And here we see an example of ABC staff being certain about something which turns out not to be true ie proof that part of the ABC’s internal world is fantasy. – Their people slogan is “It’s YOUR ABC”, but many of us point out, no rather than reflect the entire population’s views, today’s ABC reflects only a certain Green/Left viewpoint. Yes, much energy was expended on speculating about the prolonged coalition discussions that were expected to take place after the 2015 election – as you say, ‘wait and see’ would have been better advice. Everyone was caught out in 2010 by the unexpected coalition, so they went overboard in the opposite direction this time. I’m not claiming in any special insight though – all my analysis has been done in retrospect! Your further comment is very illuminating – how people try to rewrite history so as to appear ‘not quite so wrong’. I need to correct an error as I realised a tiny minority of voter do need to speculate ie those whose choice of tactical vote will make a difference. 1. Often they don’t really need to vote ..as they know their town will always vote for the same party so even if they and 1000 new friends vote for another party it will make no difference. 2. Or they have a party in their hearts and will never vote tactically. .. The minority who do need to speculate are doing things like considering if their vote might split the vote and let their hated opposition side win. I don’t instantly see how the misconception that Labour will win, effects those leftwing voters…Perhaps a Tory was elected cos the left wing vote was split and voters should have switched from Green or Liberal to Labour. But it is immediately apparent that the misconception helped the Tories cos it gave their voters a real incentive to get up and vote to keep Labour out. The BBC and media misinformation suddenly looks like a double bluff that benefits the Tories… Of course that sounds like a wild conspiracy theory. Ah hangon if the narrative had become a Tory majority vs the option of having a Tory /UKIP coalition I think that would have motivated more people to vote UKIP . That new narrative would have generated UKIP momentum, but OTOH it might have led to a UKIPhaters voting Labour in. That maybe partly true but the ABC weren’t deliberately doing that in the example I quoted..it is just a coincidence that the presenter ADDED words of certainty at the beginning of the podcast version. It think the transcript was probably the original as broadcast version, not that it have been ‘corrected’ later.